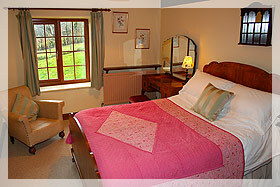 Weekends rates available, please contact us for details. The house is entered by a wide entrance porch with stone benches, ideal for walking boots, coats, wet dogs, storing dry wood etc. Spacious kitchen/dining room with long dining table and chairs, featured bread oven, easy chairs, quarry tile floor in part and old flagstones in others. Very well equipped kitchen area with fridge, microwave, coffee maker, liquidiser, food mixer & hostess trolley, electric ceramic hob and oven, washing machine, dishwasher and Welsh dresser with bright Moroccan crockery. Also, everything you need in the kitchen, plenty of cutlery, crockery and utensils and gadgets for the most adventurous cooks! There is a spacious comfortable sitting room with sofas, beanbags, widescreen colour TV, sky, video, DVD player, well stocked games cupboard and a large wood burner. There is also a further sitting room with table, chairs and an open fire, equipped with TV & video. There is also a storeroom with fridge/freezer and ironing facilities. There is a shower room with loo, shower and washbasin. The oak panelled hall leads up to the traditional wooden stairs. 2 pretty twin bedded rooms. 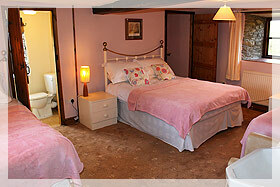 1 large en suite family room with a double bed and two single beds. 1 double bedroom with two pull out guest beds underneath. 1 large en suite family bedroom with two bunk beds. The en suites have a loo, washbasin and shower each. Efficient oil central heating, wood burner, open fire. Bed linen and tea towels included in rental. Pets welcome, but dogs kept under control as sheep in surrounding fields. 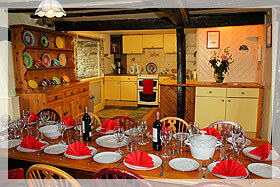 Evening meal provided upon request; a choice of home cooked 3 course dinners for � per person.